Unfortunately, little information could be found on the Peach Bowl Queens. 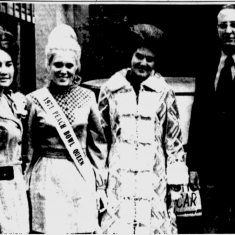 The pageant began in 1968 and an article in the Rome News-Tribune says that "for the second time in its four year history, a Floyd County contestant has won..."
In 1971, Lisa Lawalin, then 19 and attending Shorter College, was crowned. She was also the first runner-up to Miss Georgia that year. It seems the Peach Bowl Queens survived the 1990's "Royalty Raid" but unfortunately may not have survived the early 2000's overhaul prior to the recession. The last photo I could find was of Caroline Medley from a December 28th, 2003 article on the University of Tennessee Athletics website. This year's Chick-Fil-A Peach Bowl took place on New Years Eve in Atlanta, GA. It featured the University of Houston vs. Florida State, with the University of Houston ultimately taking the win.